This picture of mountain goats is one of my favorite pictures that I took in 2016, and indeed one of my favorite pictures in my portfolio. I think this is a quintessential Colorado photo, with the two goats, the great mountain view, snow and sunshine. It combines my passions of wildlife and landscape photography. From a landscape perspective it has good depth and balance and a range of interesting features, with the texture of the snow in the foreground, the rocks in the middle distance, the mountains in the background and nice clouds in the sky. From a wildlife perspective, the adult goat has quite an imperious pose, looking out into the distance as though surveying his kingdom, and the baby is mimicking this behind him. The whole photo is very sharp and well focused, from the close up snow to the distant mountains. 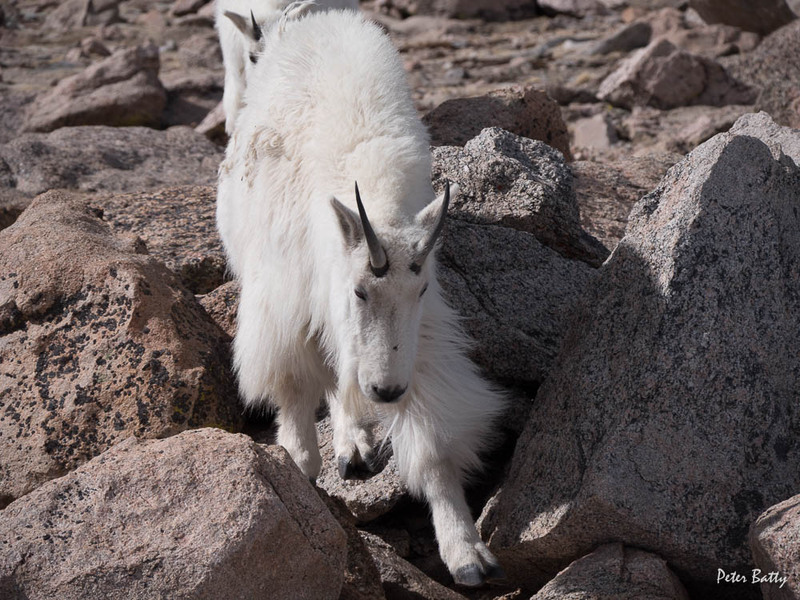 I have been to Mount Evans many times and have a large collection of good mountain goat photos. Whenever I go these days, I am not just looking for a nice sharp picture of a mountain goat, it has to be more than that. It has to have great scenery in the background or be doing something interesting. So I am always thinking about the background of the photo in addition to the subject. In some cases, if the animals are relatively still, you have time to make your composition. In other cases, like this one, they are moving quickly and you don’t have much time. The taking of the photo required a combination of a few things, including observation, anticipation, quick thinking and a bit of luck, which you always need to some degree to get this sort of combination of things in a photo. 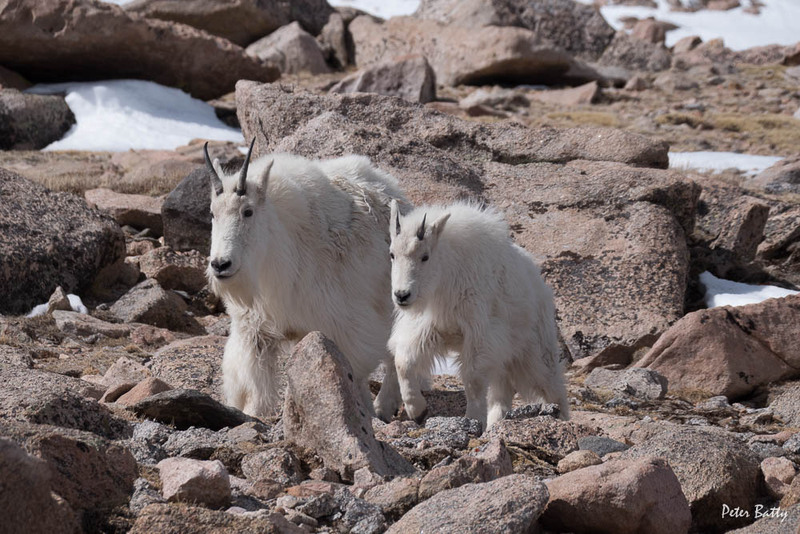 I was driving up Mount Evans and getting fairly close to the top, and constantly scanning around looking for wildlife, which is tricky as it’s a very twisty and dangerous road so you can only take your eyes off the road very briefly. I spotted a goat’s head poking above a ridge of snow higher up on the mountain, some distance away. I quickly pulled over to the side of the road, at the apex of a hairpin turn which looked out over the view you see in the picture. I had a long zoom lens on the camera as I usually do when looking for wildlife, and got a couple of quick shots of the goat in the distance. Here is the first shot I took of this goat. This was taken with my Panasonic Leica 100-400mm lens (200-800mm equivalent), which is a fantastic lens, very light and compact for the reach it has. It was only zoomed to 156mm (312mm equivalent). So the goat is a little over a hundred feet away at this point. This calculator is a cool little tool! This shot was taken at 4:47:18. At 4:47:21, three seconds later, I took this shot, and obviously had now figured out that there was a baby too, so I was excited about that. This shot was taken 2 seconds later at 4:47:23, so clearly the goats are moving fairly quickly and the scene is changing. The final shot I took with my big zoom lens was the following one, at 4:47:58, and at this point the goat is an estimated 40 feet away from me, so it has traveled around 60 feet in 40 seconds, heading pretty much straight down the mountain. My lens is at its widest zoom of 100mm (200mm equivalent) at this point. By this point I realized that they were coming pretty much in my direction, and might well walk very close to me, and if I was lucky they might walk in front of the spectacular mountain view to my left. But clearly I needed a wider angle lens in order to fit in the goats if they got any closer, and to fit in the mountain scene in the background. A real key to the image that I got was that I was visualizing the shot that I really wanted to get, and I was anticipating what the goats were going to do (while taking pictures at the same time). One advantage of using a wide angle lens is that it has a larger depth of field than a larger zoom like this one, so you have the possibility of getting a shot with a nearby subject in the foreground, and a distant background, and having both in focus. If you look at the first goat shot above, taken at 312mm equivalent focal length, the goat is in focus, but the rocks that are further away are not. So I quickly scrambled to get my Lumix 14-140mm (28-280mm equivalent) lens which was in the car, and switch that onto my (Lumix GX8) camera. The first shot I got with the wide angle lens on the camera was 24 seconds after the last shot with the big zoom lens, and by this point the goat was 19 feet away. So it’s important in this sort of situation to be decisive and act quickly. As I was changing the lens I was also thinking about what camera settings to use. I knew I would need a large depth of field to get both the goat and the background in focus, so I would want a relatively small aperture, though I would be helped by using a wider angle lens as I mentioned previously. But I also needed a fairly fast shutter speed in order to make sure I froze the movement of the goats and kept everything sharp. The goats were walking quickly and I knew I would only have a few seconds to get my shots in. So I decided to trust the auto mode (P mode) on my Lumix GX8, which is something I am a big fan of doing. Many good photographers turn their nose up at P mode, but in my experience on modern cameras (my GX8 in particular) the camera generally makes good decisions in most situations, and lets me concentrate on the important matter of making sure I get the right content in my image. This can make a key difference in situations like this when time is very tight. I watch what settings it is using as I shoot, so if I don’t think it is making good choices I can switch to another mode if needed. One bit of random good luck I had in this instance, which I only found out after the fact, was that somehow in grabbing the camera quickly when I first got out of the car, I accidentally changed the ISO setting from “intelligent auto” to ISO 800, which is a setting you would normally use in somewhat low light. The light was very bright for this picture, so having a higher ISO setting had the effect of the camera choosing both a smaller aperture and a faster shutter speed than it would have done with the auto ISO setting (I assume), both of which were what I wanted. I think I would have still got a good shot without this ISO change, but this inadvertently helped make sure I got the sharpness and depth of field I was looking for. This technique of using a higher ISO in good light is potentially a good one to use intentionally if you are looking for both a fast shutter speed and a large depth of field, whether using P, S, A or M modes. Once I had the right lens on, I just remained still next to my car as the goats walked quickly down the mountain, and fortunately they did indeed walk by where I hoped they would. My distance estimator says that the goats were about 14 feet away from me at this point. This is probably a good point to say that of course you should not approach wild animals too closely, and this is closer than I would normally approach a goat. 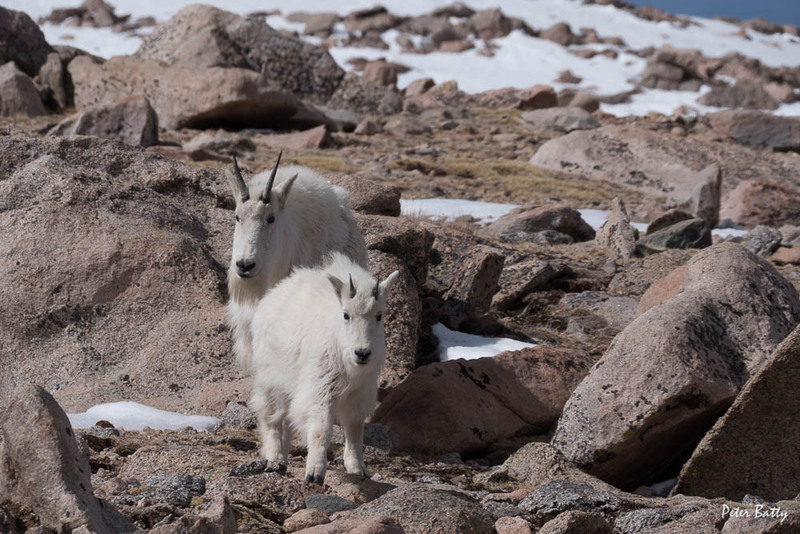 However, on Mount Evans the goats are very accustomed to having people around, and my experience there is that if you just stand or sit still they will often come quite close but just ignore you, as they did on this occasion. Plus I was right next to my car, just in case I needed to hop into it! The goats were walking quickly across the mountain view, so I snapped as many images as I could in high speed burst mode, framing the shots to try to get a good composition for both the background and the goats. Altogether I got a total of 50 shots in the space of about 15 seconds as they walked across my field of view, of which I would say about 36 in the space of 10 seconds were really in front of the best viewing area. This video sequence is made from the 50 shots I took over the 15 seconds, so gives a reasonable impression of the speed they moved at and the shots I got, though of course it’s a bit jerkier than real life was! 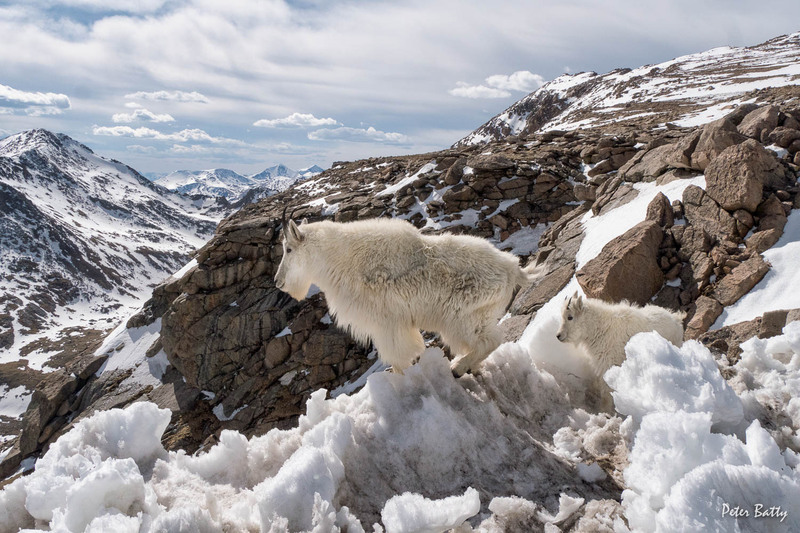 Mountain Goat photo sequence on Mount Evans from Peter Batty on Vimeo. I got a number of good shots in this sequence. I chose the one at the beginning of this post as the best because I liked the way the large goat is looking out over the mountain view, and the baby is doing the same. But the following are all candidates too. The top three of these are the same two goats and are all part of that 50 shot sequence in the video. The last one was another goat that followed the first two ten seconds or so later. There are several factors that make this a unique picture that is hard to reproduce. One is obviously just getting not just one goat but two, and not just any two but a male with good horns and a baby, in a location with such a good view and where I can manage to get this close to them – if this was taken from further away with a longer zoom, it wouldn’t be possible to get both the background and the goats in focus. There are not many spots along Mount Evans Road with such a good view including good details in both the middle and far distance. 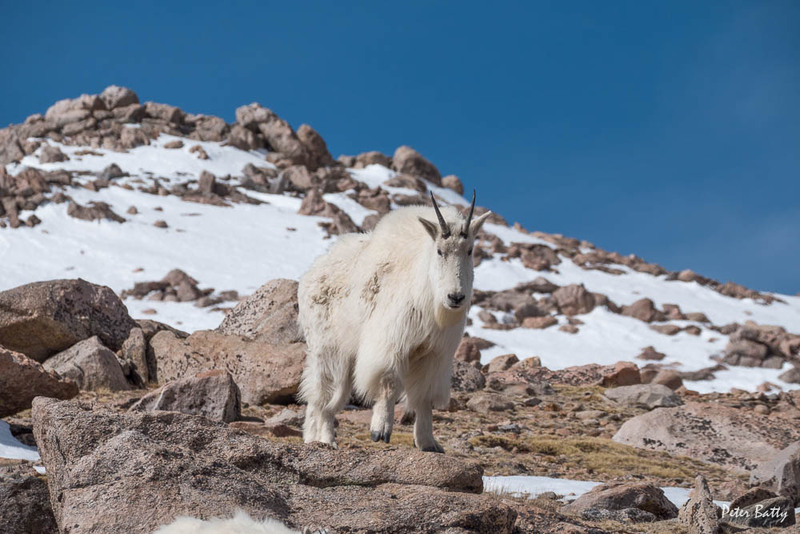 Another important element of the picture is the snow, especially in the foreground but also in the background, and there is only this much snow for a short period of time after Mount Evans Road opens for the season, normally on Memorial Day (at the end of May). These pictures were taken on June 2. You can also tell this is an early season picture because the goats still have their winter coats – the adult is just starting to lose his very slightly, but for much of the season apart from the beginning and the end the goats are shedding their winter coats and don’t look as nice as they do with a full coat. And on top of all that there is a nice interesting cloudy sky – though still with sun on the subjects. One of the great things about living in Denver is that you can get these sort of shots after work. On this day I left downtown Denver just a little early, around 3pm, and was up near the top of Mount Evans by 4:30pm.